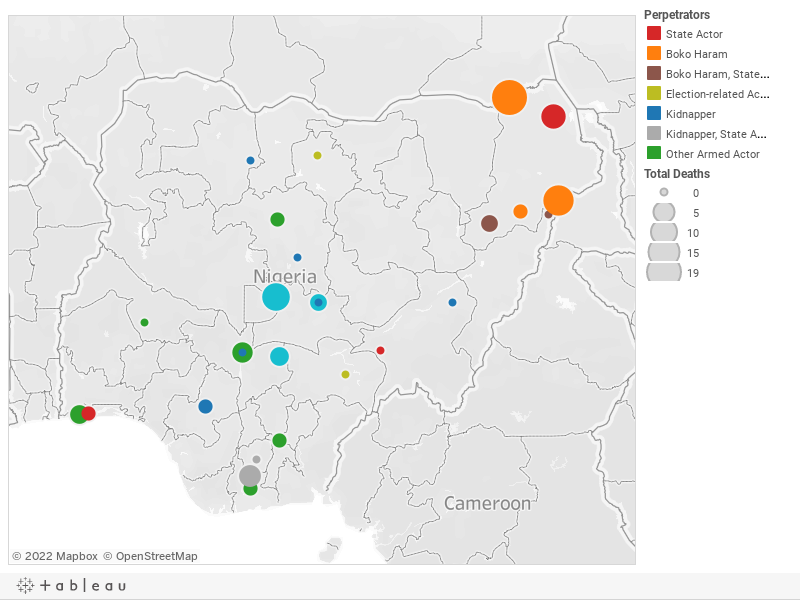 Below is a visualization and description of some of the most significant incidents of political violence in Nigeria from March 23 to 29, 2019. This update also represents violence related to Boko Haram in Cameroon, Chad, and Niger. These incidents will be included in the Nigeria Security Tracker. March 23: Boko Haram killed seven Nigeriens and kidnapped two in Diffa, Niger. March 24: Herdsmen killed two in Akwanga, Nassarawa. March 25: A Catholic priest was kidnapped in Kachia, Kaduna. March 25: Sectarian violence resulted in "many" (estimated at ten) deaths in Izzi, Cross River. March 25: A Boko Haram landmine killed thirteen soldiers in Gwoza, Borno. March 26: A North Korean doctor was abducted in Tsafe, Zamfara. March 26: Boko Haram killed ten and lost two militants in Diffa, Niger. March 27: Kidnappers abducted a policeman and four others in Esan South, Edo; the policeman was later killed. March 27: Gunmen abducted the former Nigeria Bar Association Chairman in Jalingo, Taraba. March 27: Boko Haram killed one policeman and one civilian in Biu, Borno. March 27: Gunmen abducted four in Akwanga, Nassarawa. March 27: Sectarian violence led to three deaths in Omala, Kogi. March 28: Police killed five kidnappers in Ikwerre, Rivers. March 28: Boko Haram killed one in Chibok, Borno. March 29: The Multinational Joint Task Force (MNJTF) killed five Boko Haram militants in Kukawa, Borno; another two militants were killed by a landmine planted by Boko Haram.